Definition at line 453 of file X86DisassemblerDecoderCommon.h. Definition at line 454 of file X86DisassemblerDecoderCommon.h. Referenced by translateImmediate(), and translateOperand(). 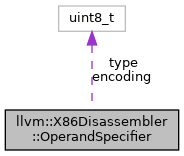 Definition at line 455 of file X86DisassemblerDecoderCommon.h. Referenced by translateImmediate(), translateOperand(), and translateRM().